Have you had trouble getting a logo done, due to cost or just because you can’t figure out what you want? If you don’t have a graphic designer, give Hatchful (an automatic logo generator) a try. The logos it produces are pretty basic, but may do in a pinch. For example, I created this logo for the fictitious Greenfield Farm in LESS THAN TWO MINUTES! When I was done with the basic design, Hatchful emailed me a folder with over a dozen versions of the logo, formatted and sized for a Facebook cover image, LinkedIn banner, a favicon, and more. Even if you don’t end up using the Hatchful logo you create, it can help you think about what you want your logo to look like. Xtensio provides templates to help you write and design reports, presentations, landing pages, and other materials. Their modifiable templates come with instructions and sample text. 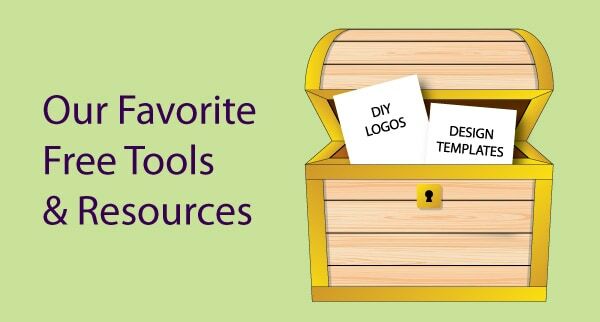 You can create digital files, pdfs, PowerPoints, camera-ready artwork, etc. Say you need a sell sheet for your business or organization. 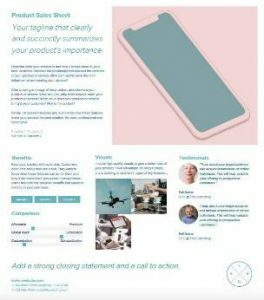 A sell sheet (also called a sales sheet or product datasheet) is a one-pager that succinctly presents your product or service. It uses persuasive copy and images to convey how your product benefits the people who use it. To use Xtensio, you just open a template, read the suggestions, and start drafting text right into the file. The basic version is free, but it does have Xtensio branding on it. If you don’t want to buy the paid version, you can still use Xtensio for inspiration. 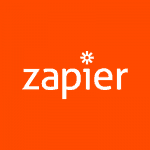 Zapier is a cool tool that lets you automate hundreds of repetitive tasks without knowing any code. For example, you can move info between two apps that you use all the time. Want to automatically save Gmail attachments to Google Drive? Want to send a coupon to your MailChimp subscribers on their birthdays? Want to post new Instagram photos to your WordPress blog? Yeah, Zapier can do that. There are several levels of paid subscriptions, but the free version is probably sufficient for your needs. As a food marketer, I’m always trying to keep up on food industry news and trends. Project NOSH (Natural, Organic, Sustainable and Healthy) is one of my favorite sources. NOSH is a fast-growing information and training resource for “entrepreneurial” food and beverage companies and the businesses that work with them. In addition to a comprehensive website, daily news updates, and job listings emails, they have a great food industry podcast (which I listen to often) and offer events (which I’ve never attended). Most of their stuff is free, except for events, job ads, and video training courses. but I’m looking for how-to info rather than insight and inspiration.) Patel’s got a goofy, everyman persona that makes marketing seem fun and easy. In addition to the blog, Neil Patel’s website offers a free keyword suggestion tool and an A/B Testing Calculator. You can also get a free SEO Audit. While Patel’s ultimate goal is to get new customers for his company’s marketing services (by giving away great advice so he ranks at the top of the search engines), you don’t have to buy a thing to benefit from his expertise.